The Skylanders Swap Force is a collection of 16 virtual and physical characters in the popular Skylanders game lineup. Just like previous Skylanders creations, your child can play with the real-world action figure, or integrate it with his or her video gaming console for a virtual version of the game. The new Skylanders Swap Force game and required Power Portal are available for all the major video game systems, and are backwards compatible with previous Skylanders figures. 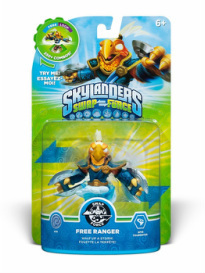 Who Will Enjoy the Skylanders Swap Force Line of Products? 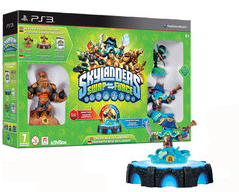 The original Skylanders action figures could actually be transported virtually to your Wii, Xbox, Nintendo 3DS, Sony PS3 or other video gaming system through a special Power Portal connected via a USB cord. Your physical Skylanders character then entered the virtual version of the game, and this unique dual element has proven very popular. The new Swap Force Skylanders add another dual-centered twist to 16 new characters - you can swap and interchange bottoms and tops on these new pieces. This really drives your child's creativity, as each of the new Swap Force figures possesses certain characteristics and powers that are central to the upper and lower halves of their bodies. 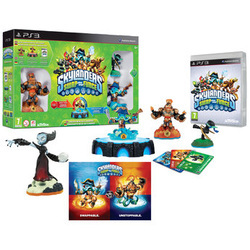 This Activision creation allows you to create hybrid characters, moves and powers, and each video gaming system requires a Swap Force Skylanders starter kit to access these new characters. Kids have excellent imaginations, and this "real life to video game display" journey for the characters they build allows them to view their morphed creations performing actions and possessing powers they can see, hear and control, not just in their mind. The new abilities include flying, bouncing and teleporting, allowing for exploration of previously unsearchable areas and sections of Skylands. The Swap Force Skylanders system also delivers 8 new LightCore characters, as well as 16 original versions of "fan favorite" Skylanders characters. New Swap Force character names are Blast Zone, Boom Jet, Doom Stone, Fire Kraken, Free Ranger, Freeze Blade, Grilla Drilla, Hoot Loop, Magna Charge, Night Shift, Rattle Shake, Rabble Rouser, Spy Rise, Stink Bomb, Trap Shadow and Wash Buckler. After you purchase a Starter Pack for your child's particular video gaming system, you can play with the characters in that starter kit, and purchase additional adventure and battle kits and bundles. The new Swap Force has upgraded visuals over the original Skylanders model, and it is nice to see sharper graphics. If you have a young gamer in the house, especially one familiar with the Skylanders universe, these new swappable characters with improved and customizable virtual powers and abilities are sure to be a hit.